Today DOT announced a “dusk and darkness” traffic enforcement and education campaign to reduce pedestrian injuries and deaths during fall and winter, when fatal crashes tend to be more frequent. 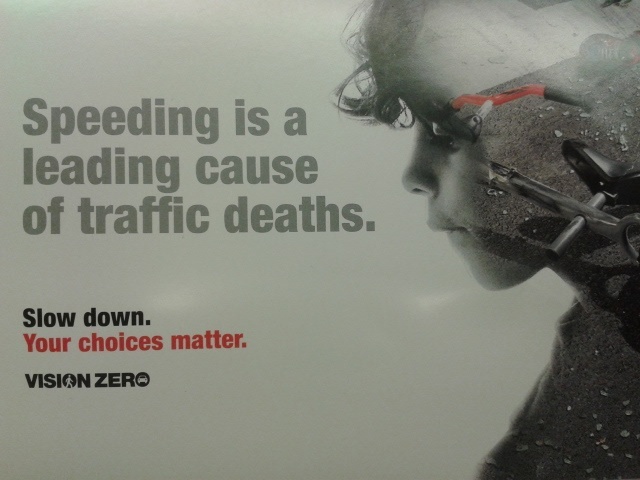 Trottenberg cited the redesigned approach to the Manhattan Bridge as a project that will “make crossing our busiest streets safer for everybody,” but that project is independent of the new seasonal safety campaign. There’s nothing wrong with drawing attention to the fact that streets are more dangerous this time of year, but it’s no substitute for street designs that make walking safer year-round. Severe crashes that harm pedestrians increase by almost 40 percent on fall and winter evenings compared to other seasons, according to DOT. 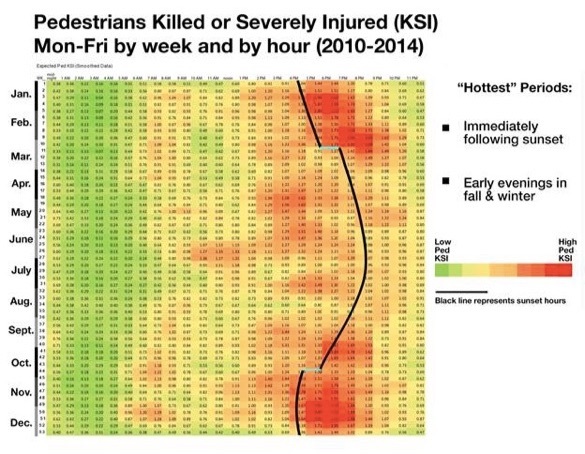 In the coming weeks, NYPD will step up police presence and enforcement of dangerous driving behaviors “around sunset hours when data show serious pedestrian crashes increase,” according to a DOT press release. NYPD will also conduct targeted enforcement at intersections with high rates of pedestrian injuries and deaths. 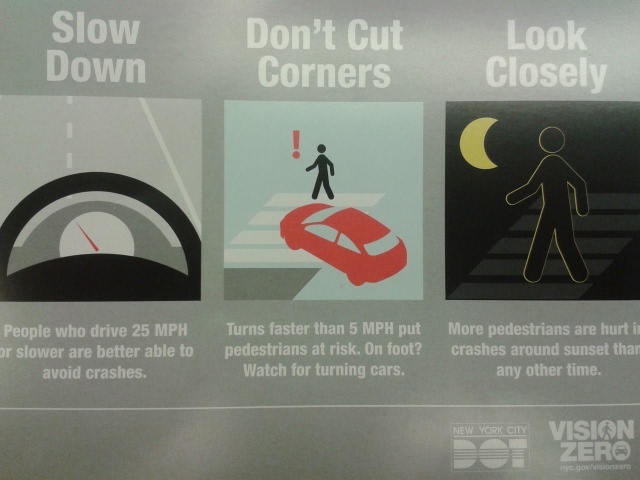 In addition, NYPD and DOT will “educate drivers and other New Yorkers at high-priority Vision Zero target areas” by distributing palm cards, the press release says, some of which will remind motorists that they’re required to yield to pedestrians while making left turns. Senior centers have already received materials on “improving safety conditions in their neighborhoods and sharing tips for getting around safely,” according to DOT. The Times reported that the city will spend $1.5 million on the campaign. Last summer, TA called out Mayor de Blasio for shortchanging life-saving street redesigns. DOT has identified the city’s most dangerous streets and intersections, but improvements are not being implemented on the timetable prescribed by Vision Zero. De Blasio denied the City Council’s request to increase DOT funding for safety fixes in the latest budget. Trying to fight nature with ticket blitzes and palm cards will have a marginal effect at best. What Vision Zero needs is a bigger budget for street redesigns. Meanwhile out here in Jackson Heights…the daily undercover car operation of pulling over cyclists on 34th Avenue continues – still haven’t seen one day of walking or biking it without one person getting a ticket. And yet two separate nights this week was walking down Northern Boulevards with NYPD vehicles coming up behind double-parked cars and beeping and flashing lights at them to move along. Saw at least a dozen cars shoved along but, as you might guess, no parking tickets. Not even a warning by getting out of the car. NYPD 115th Precinct double standard. The sun sets in Copenhagen as early as 3:40 PM during the winter. In Amsterdam, it’s about 4:30 PM. One can only hope and pray that our city would start looking to those cities to figure out how they keep people alive after dark. It can’t be that they’re handing out pamphlets and running radio ads about driving carefully. Ahh the 115th! Almost as bad as the 114th in my old stomping grounds, Astoria. It’s city wide though, Clarence, and has been for decades. To them (NYPD) bikes and bicycle infrastructure is something mirthful and comical and only fools commute. In their minds real people drive to work, only kids use bikes. The incentive to jaybike lights on 34th Avenue is the most powerful I’ve seen anywhere in the city. You’ve got car doors on the right and close-passing drivers on the left, who can’t give you the extra room they do (and most NYC drivers do in my experience, if they can) on every other 2-way street in the city because of the concrete median. Who wouldn’t want to get a head start on traffic? To them (NYPD) bikes and bicycle infrastructure is something mirthful and comical and only fools commute. In their minds real people drive to work, only kids use bikes. Gotta say, interactions like this cause me to distrust the NYPD. Please do submit a formal complaint. Nothing will happen, but at least there will be a record when someone begins to care. They’re handing out these cards on the street. It’s a good message, but I agree that the money could be better spent. Speaking as someone who said he was interested in data on when people are killed and injured, I’m glad it was produced and released. Letting drivers and pedestrians know that some times are more dangerous doesn’t strike me as a bad thing. De Blasio Commits $250M to Overhaul Major Streets, But How Far Will It Go? The redesign will shorten crossing distances for pedestrians and shield cyclists from car traffic.